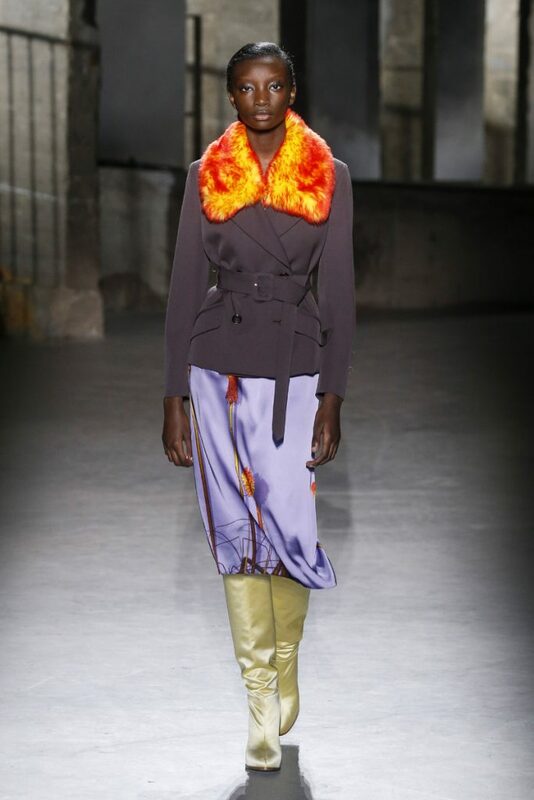 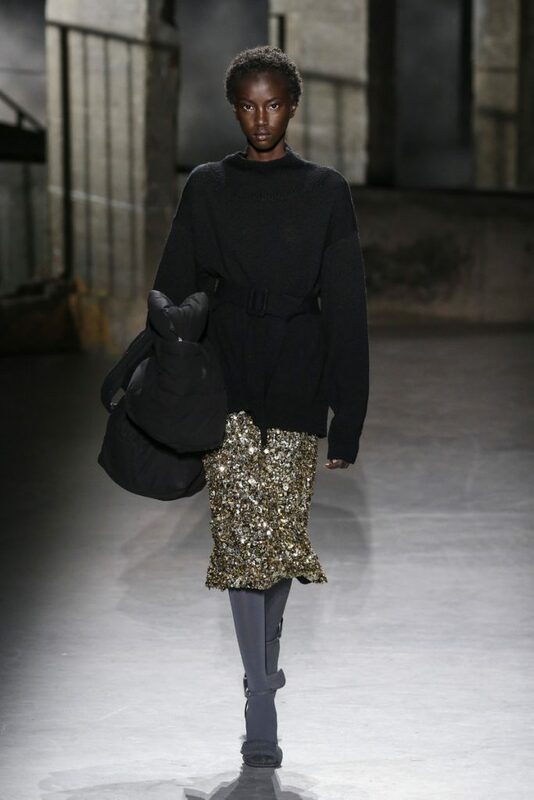 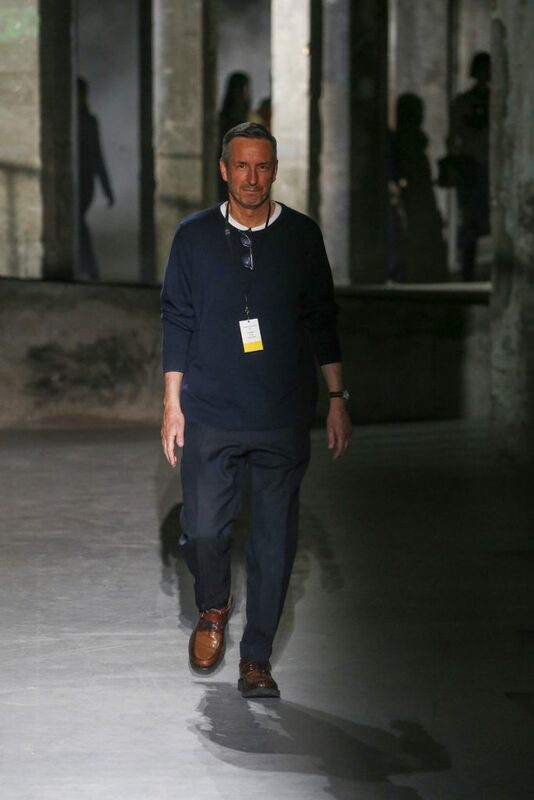 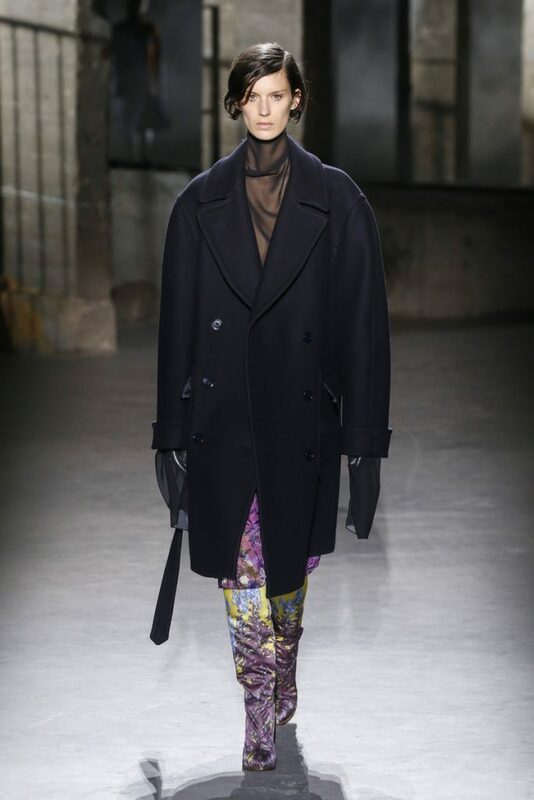 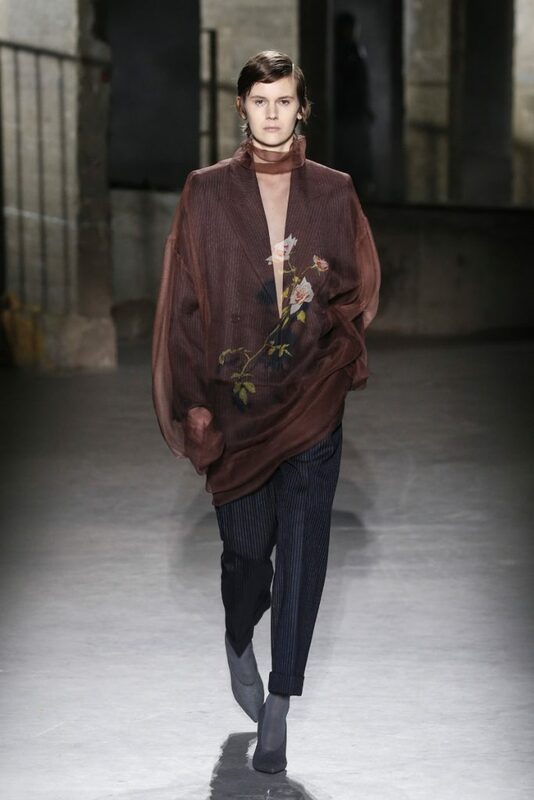 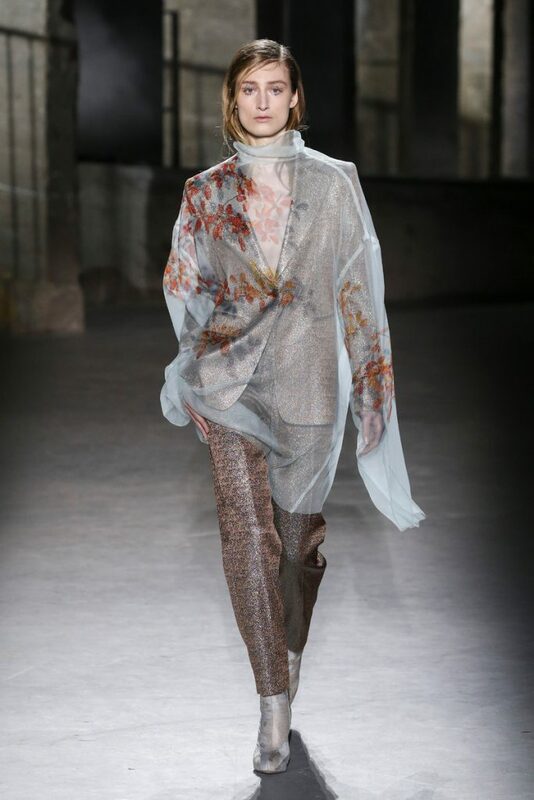 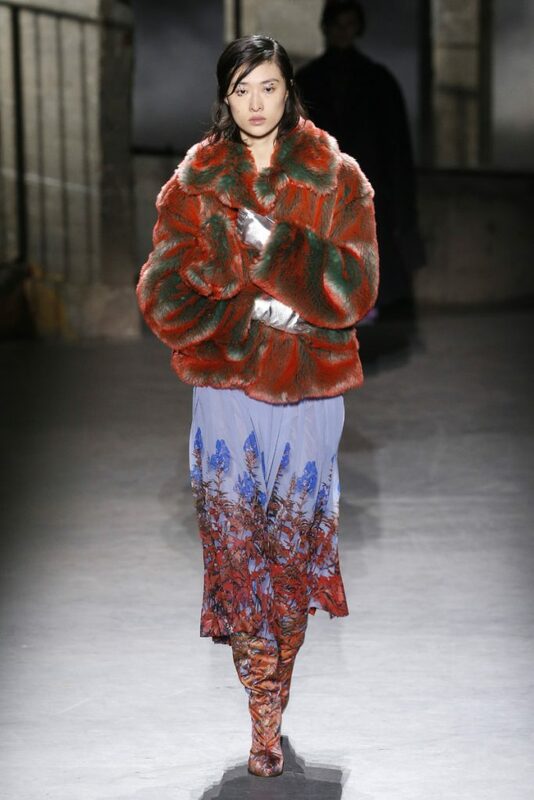 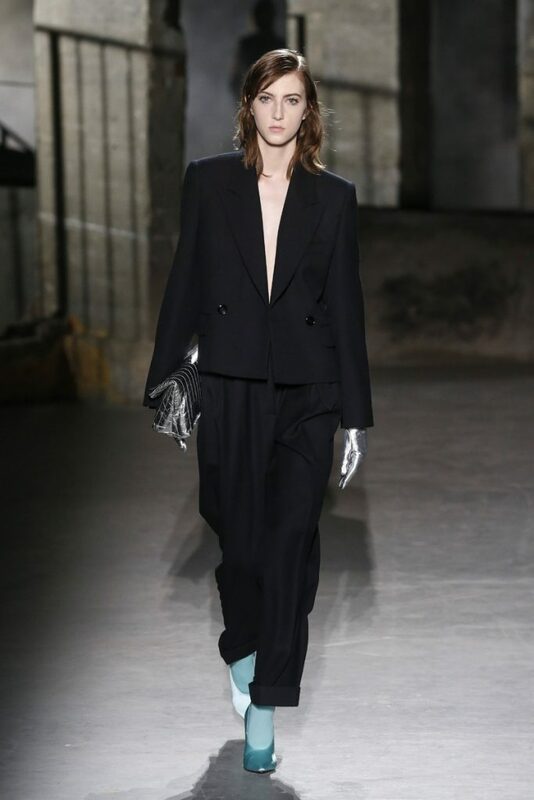 Dries Van Noten started off rather somber today. 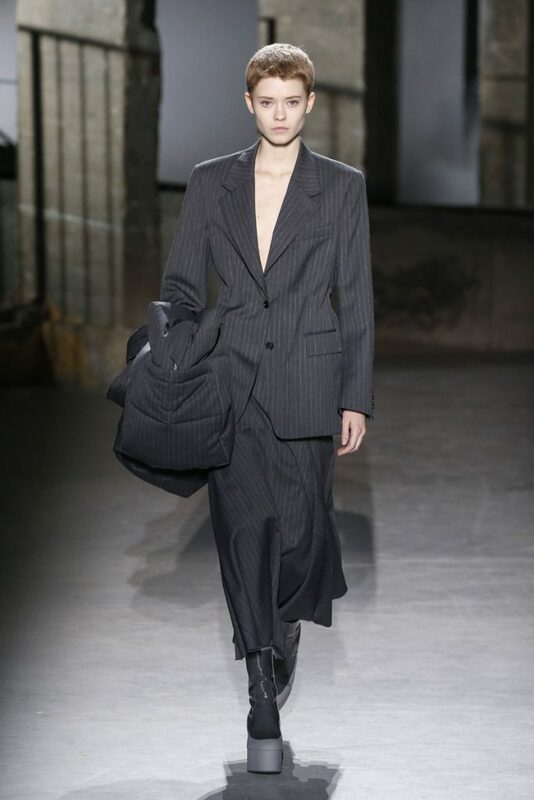 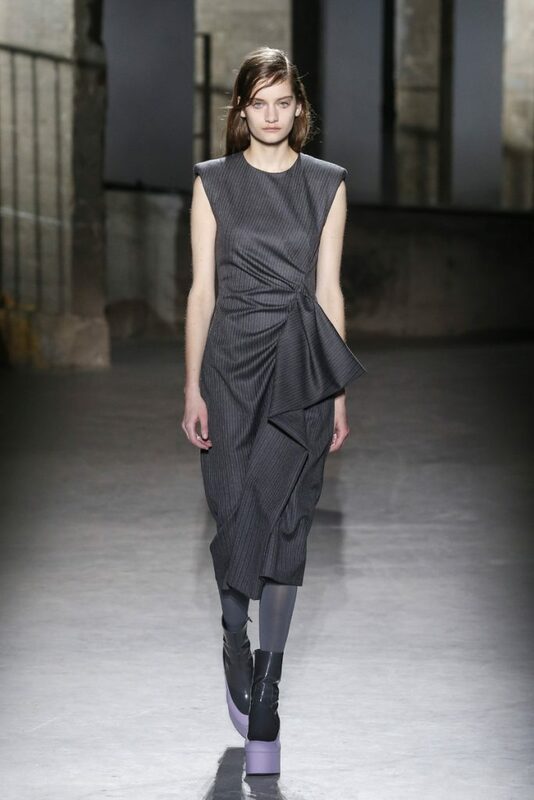 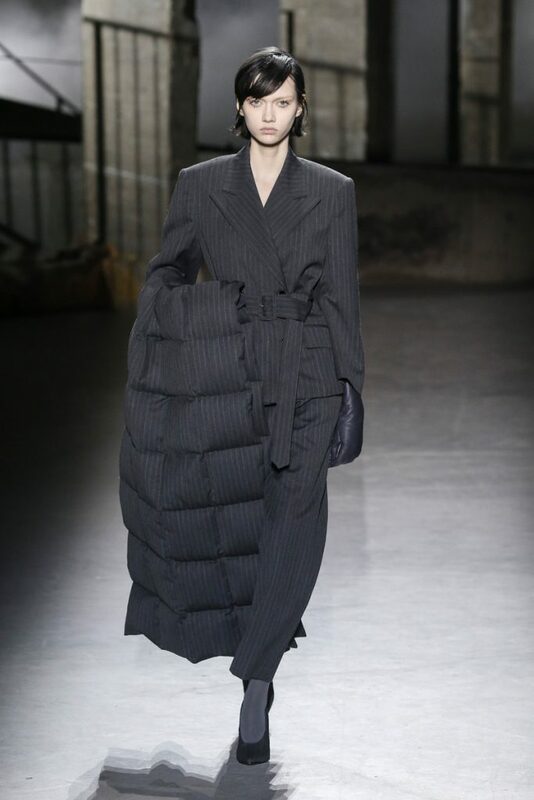 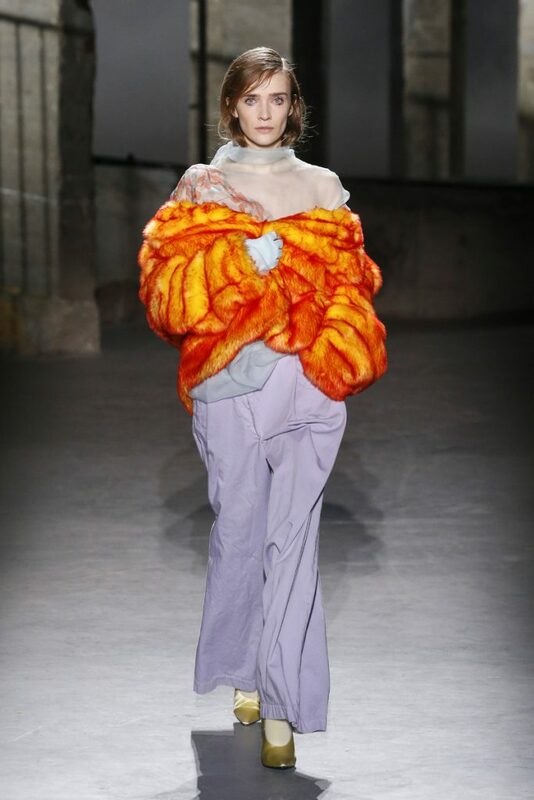 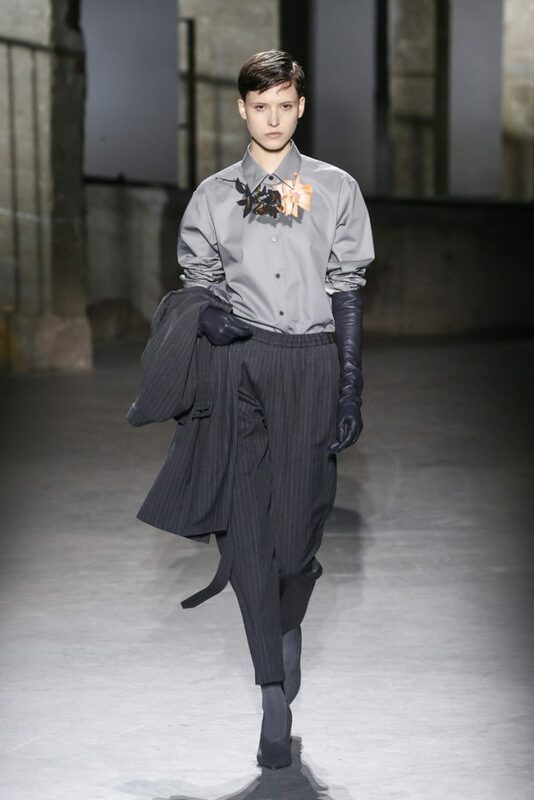 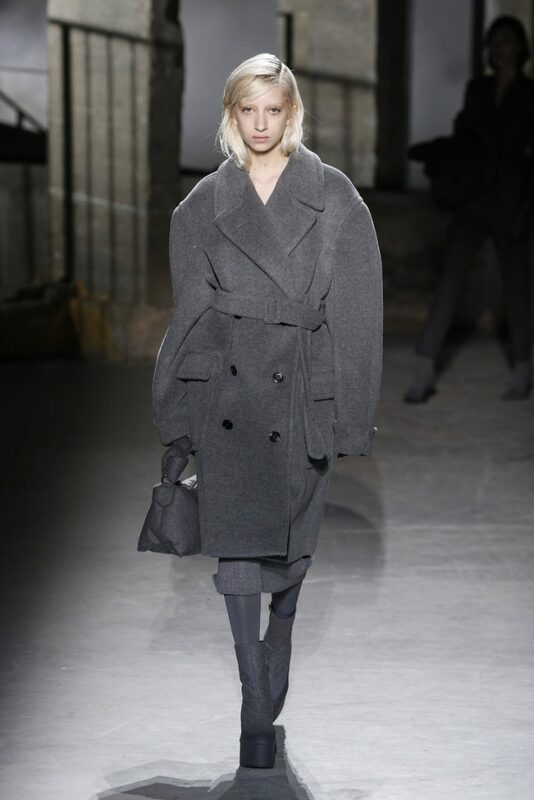 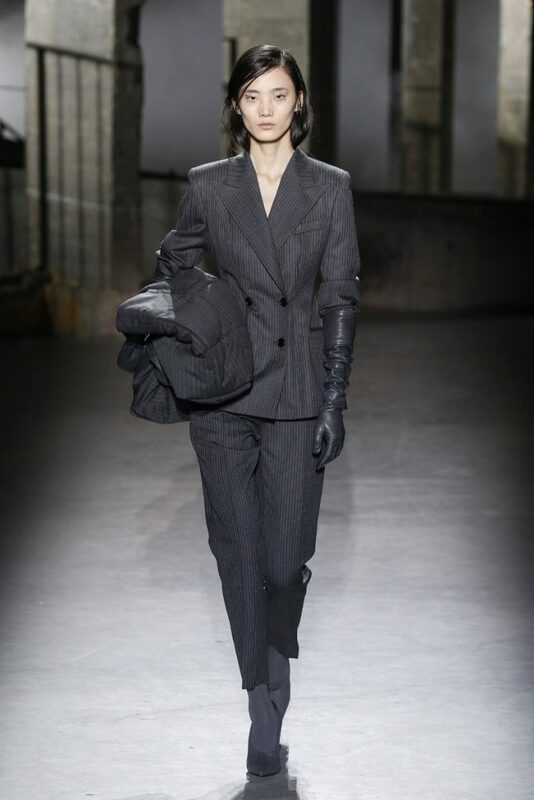 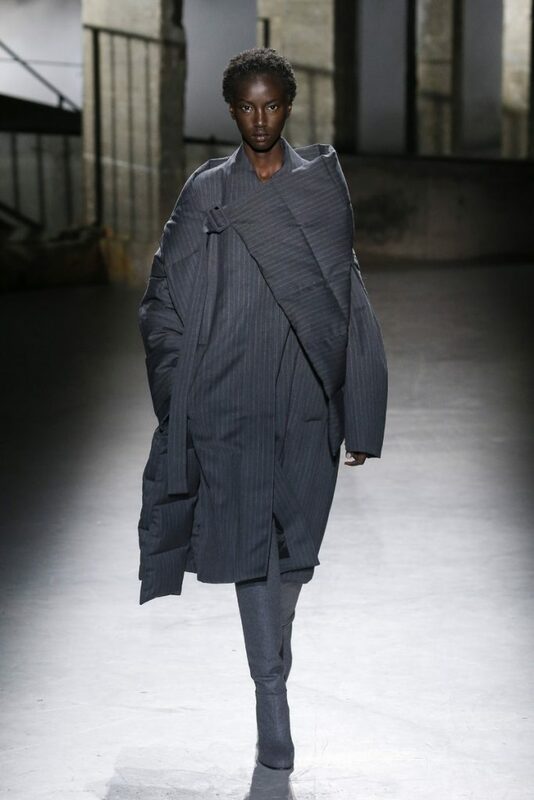 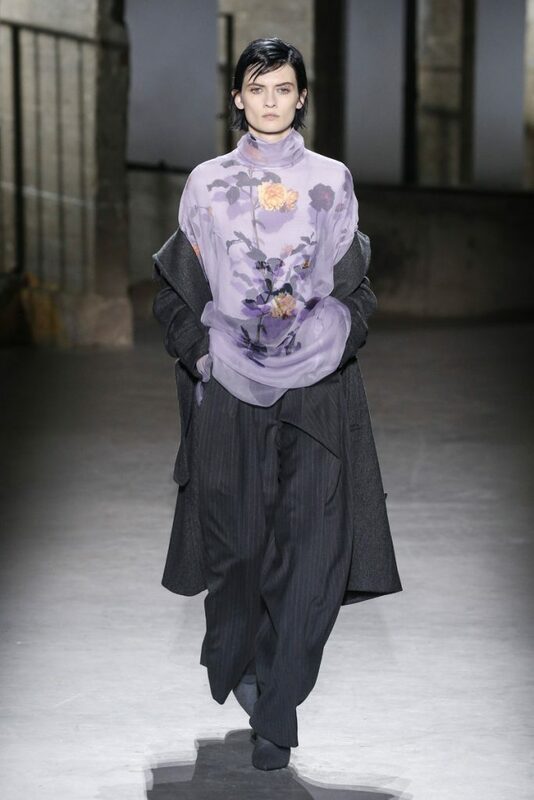 The first series of looks that appeared on the concrete runway at Palais de Tokyo were grey colored and pinstriped. 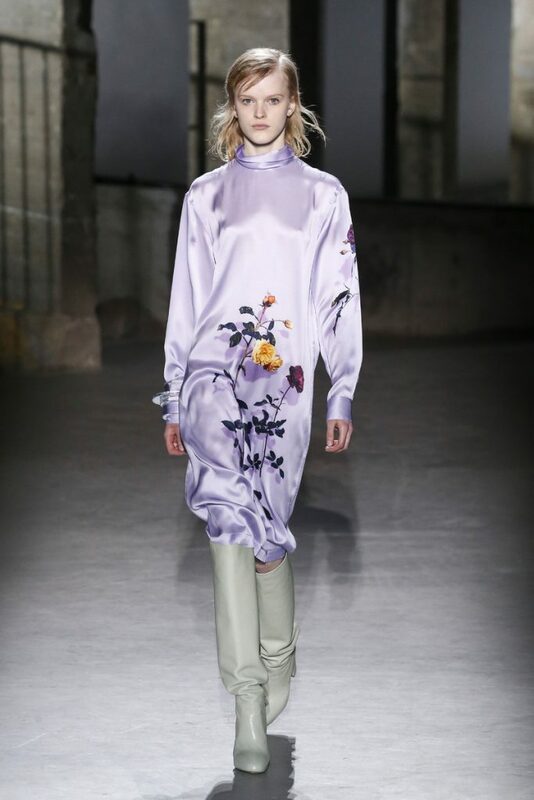 Yet with looks the designer changed things up a bit and when we arrived at look #9 the office ready dresscode had made way for cocktail chic when Hannah Motler came on wearing a lilac satin dress with floral embroideries and chunky boots. 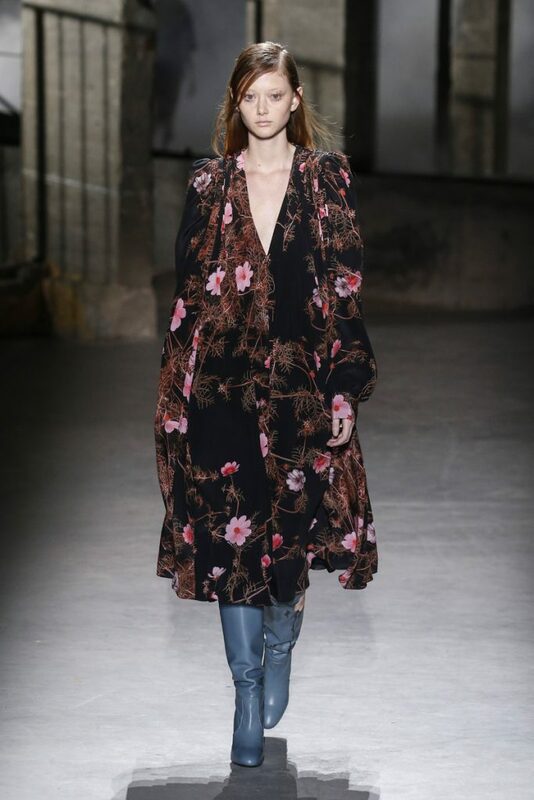 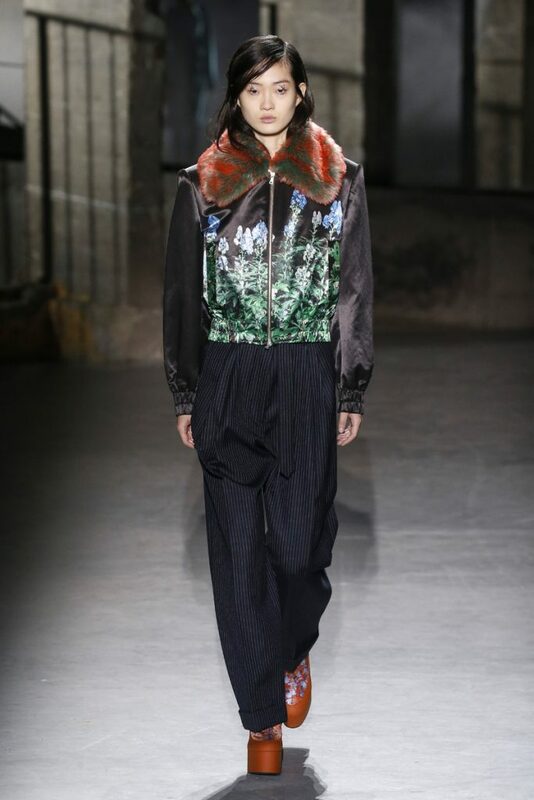 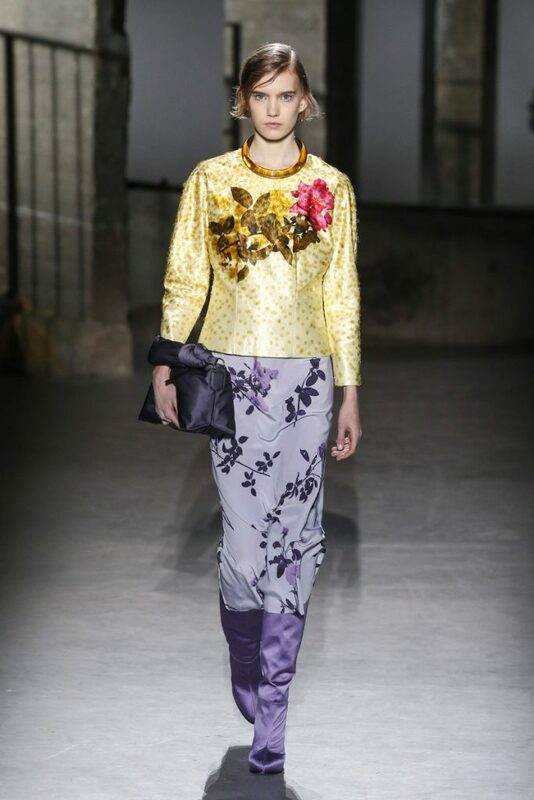 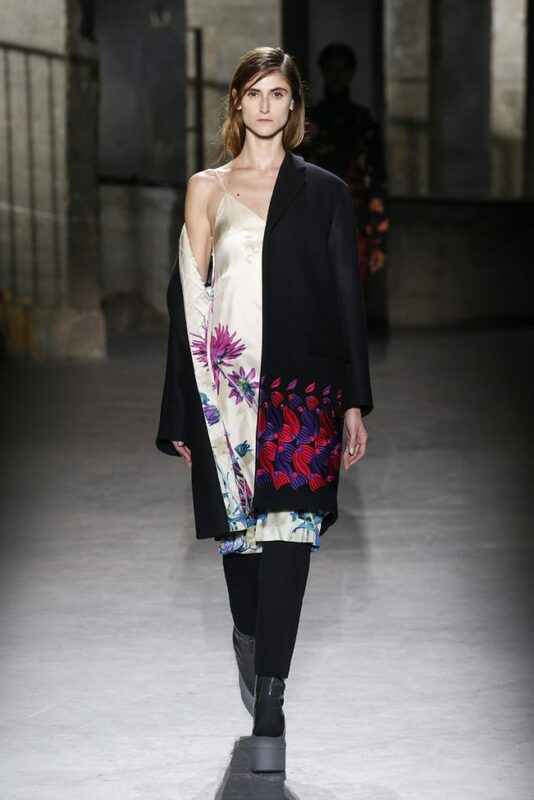 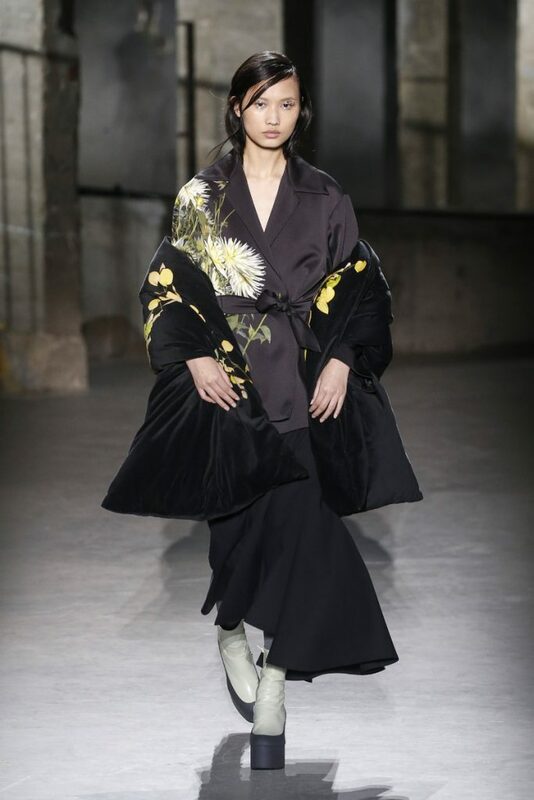 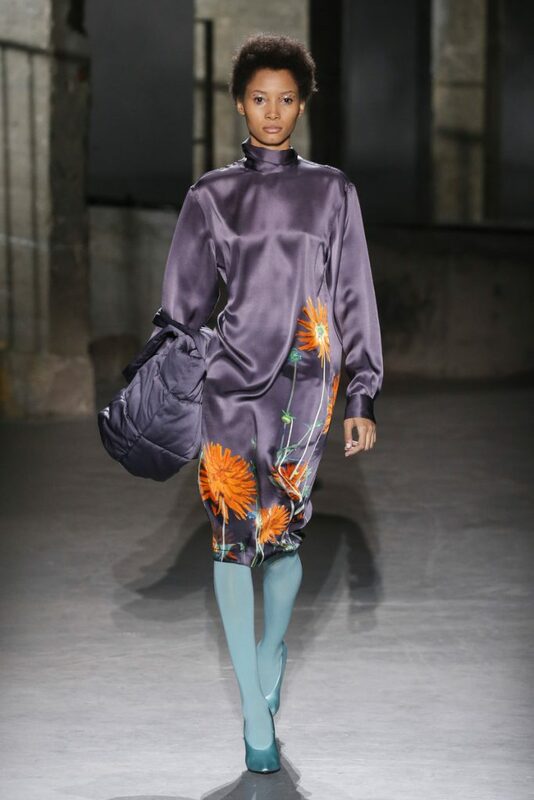 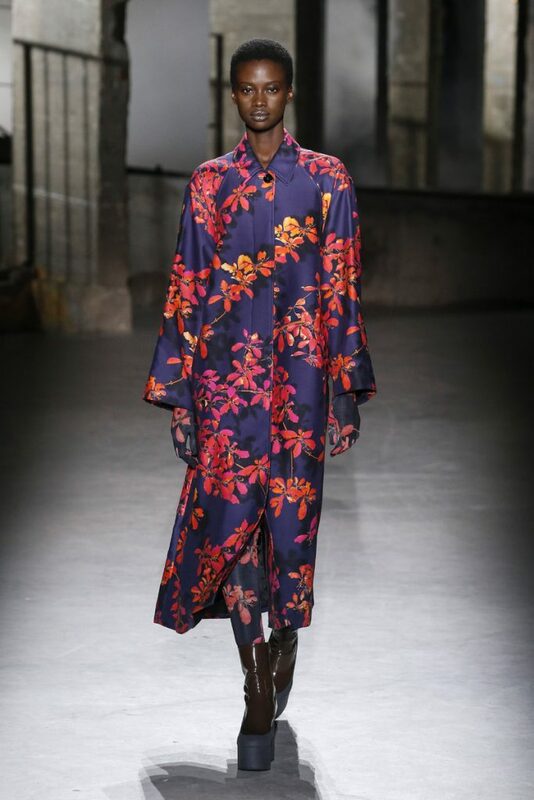 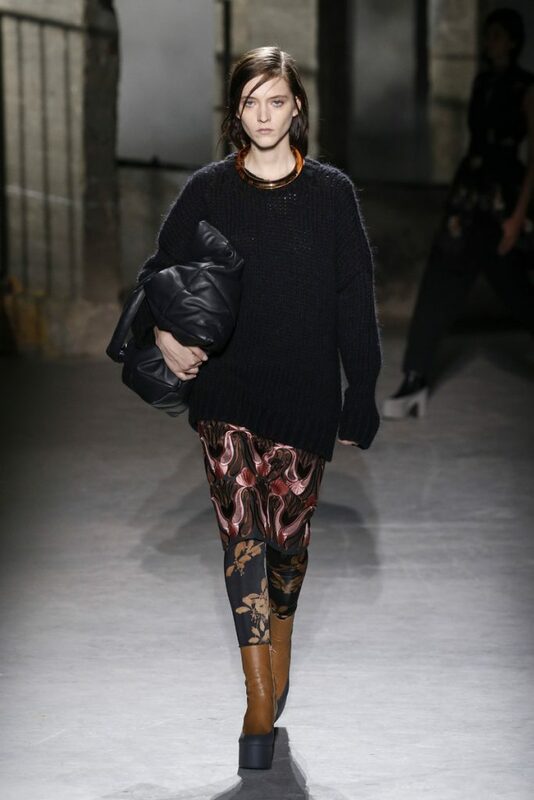 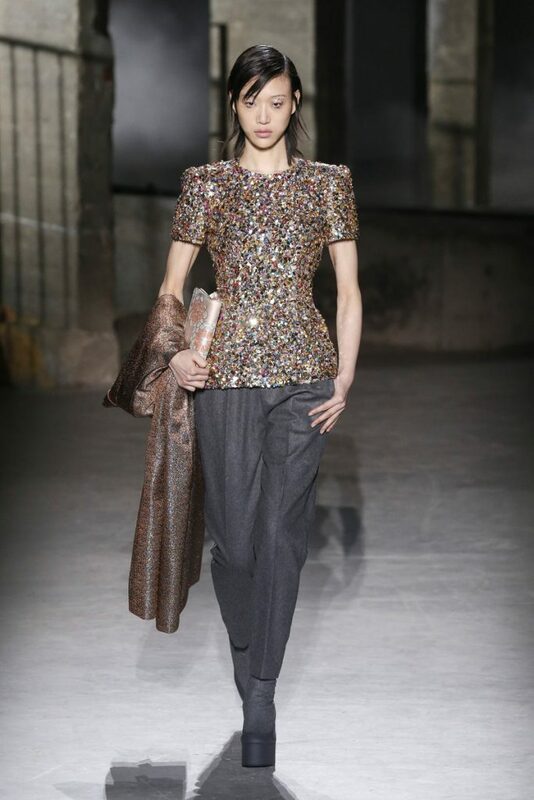 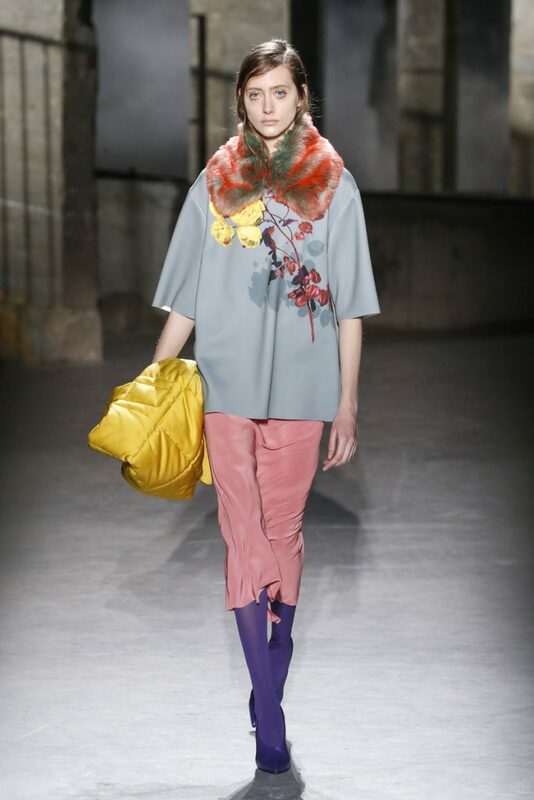 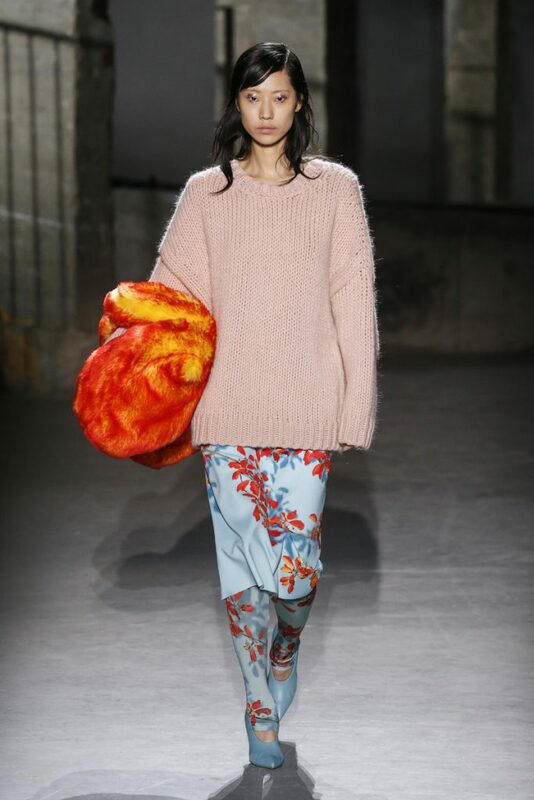 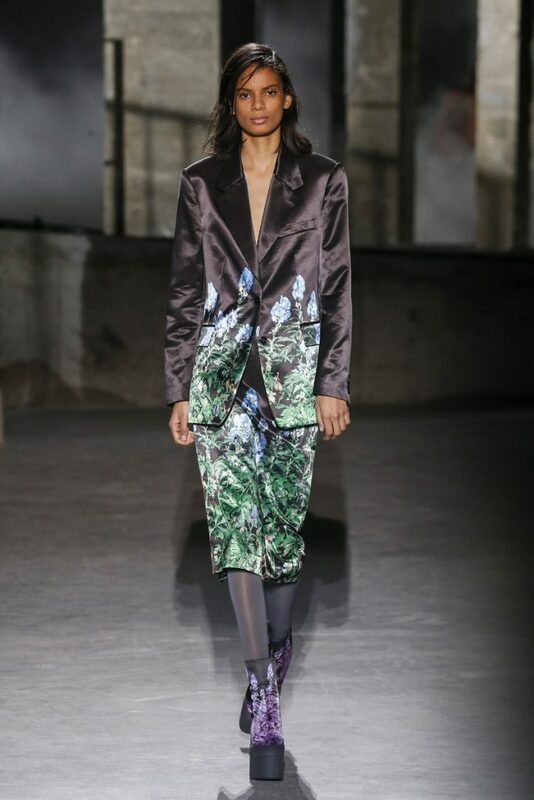 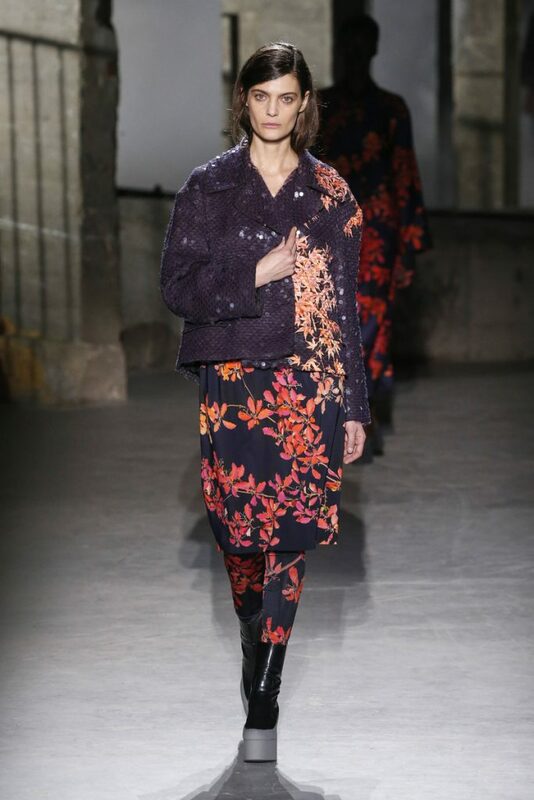 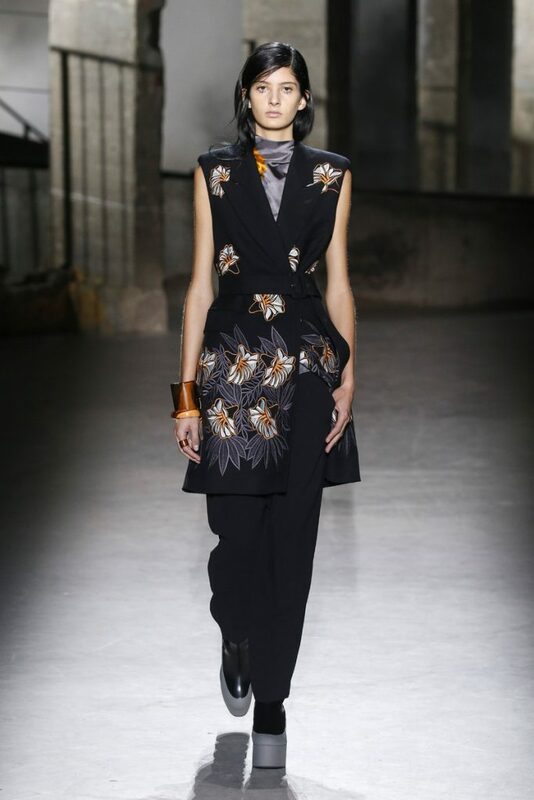 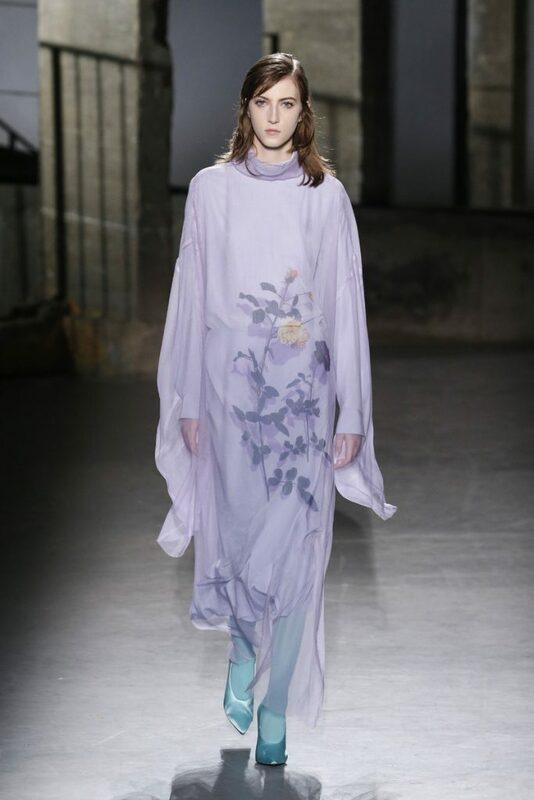 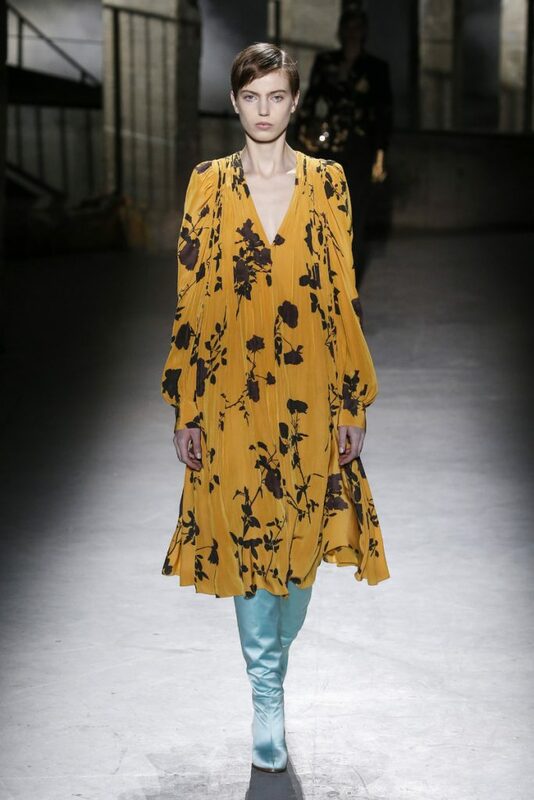 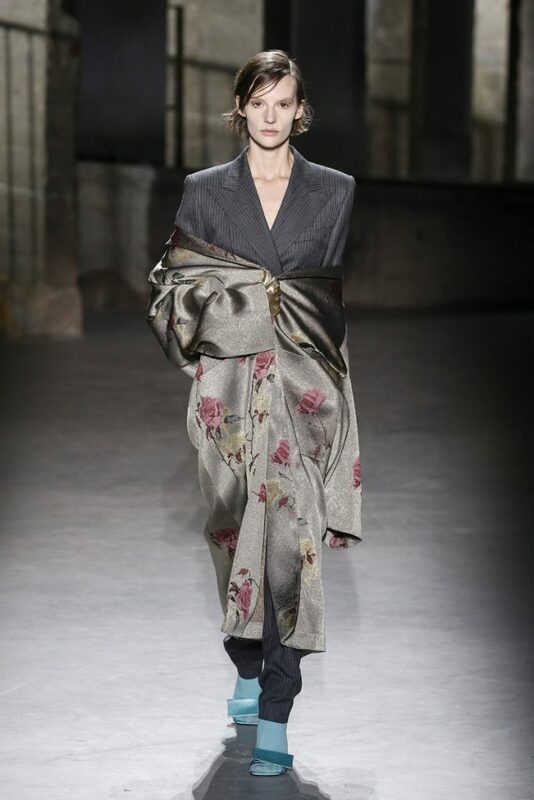 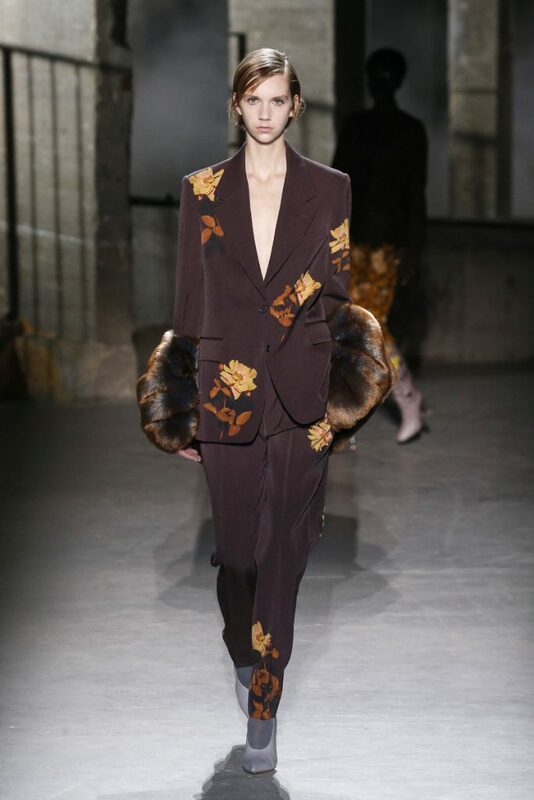 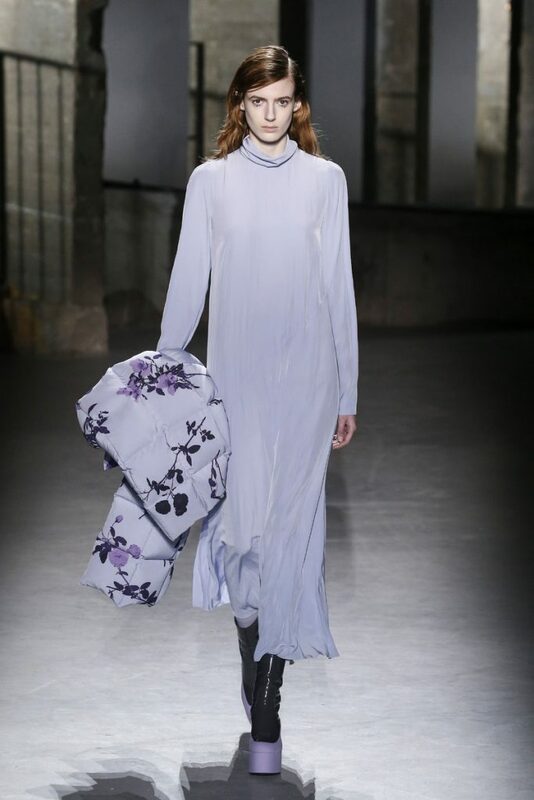 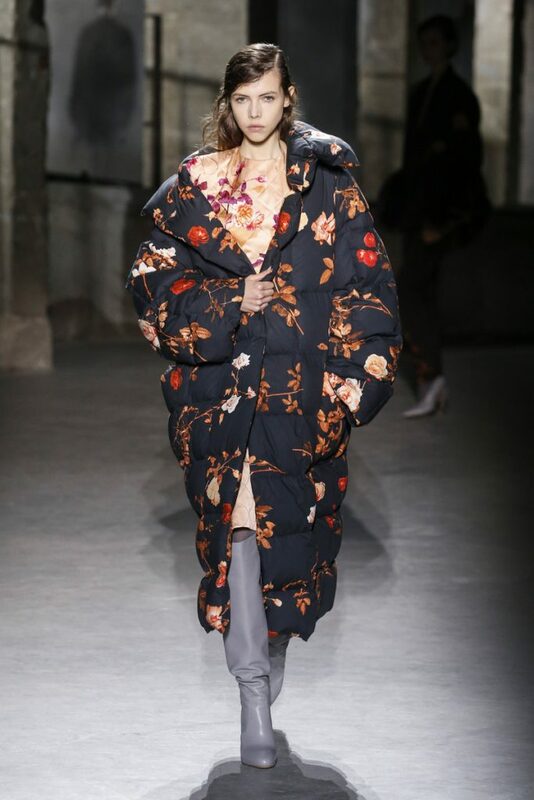 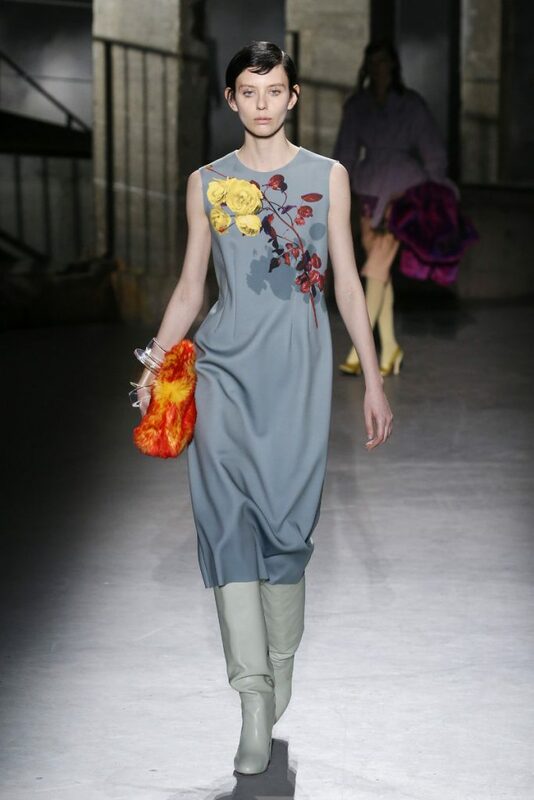 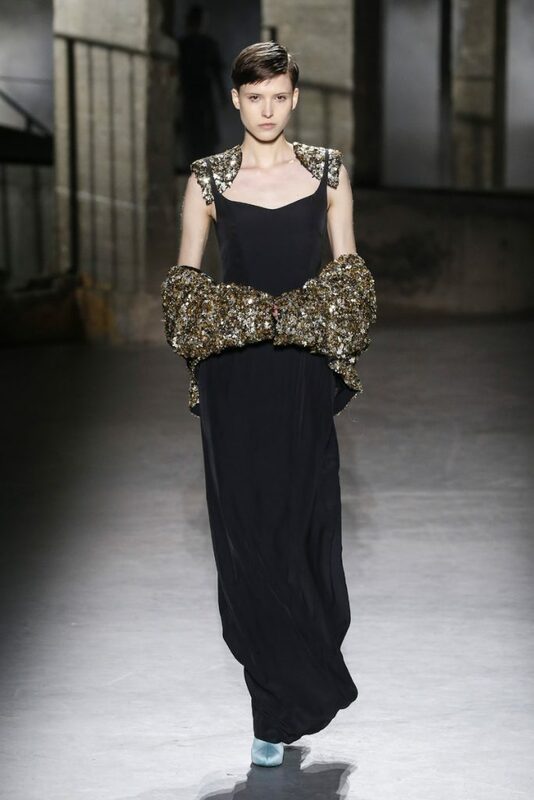 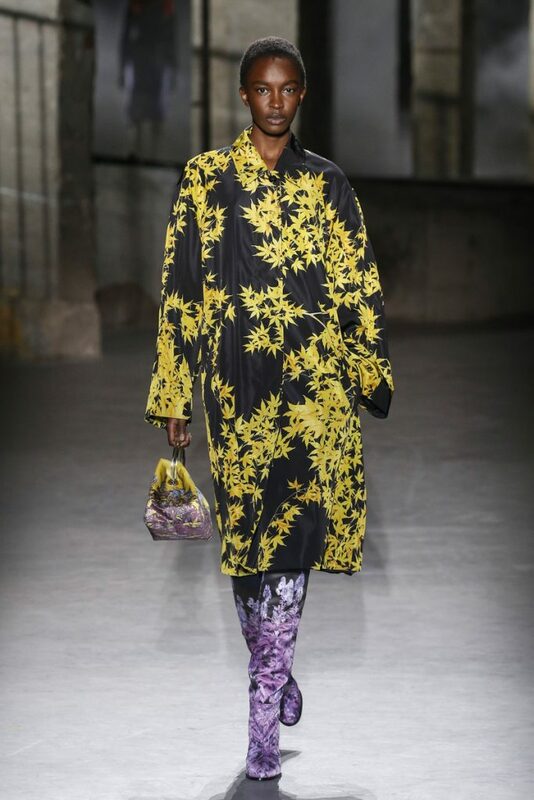 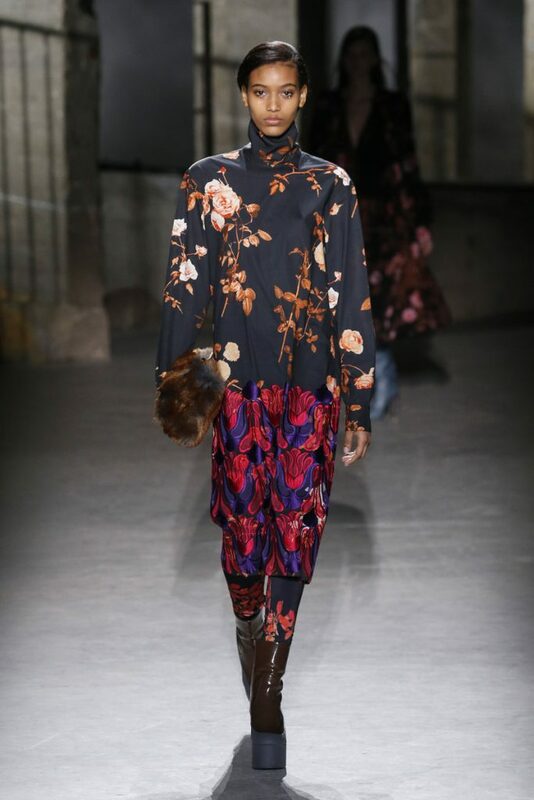 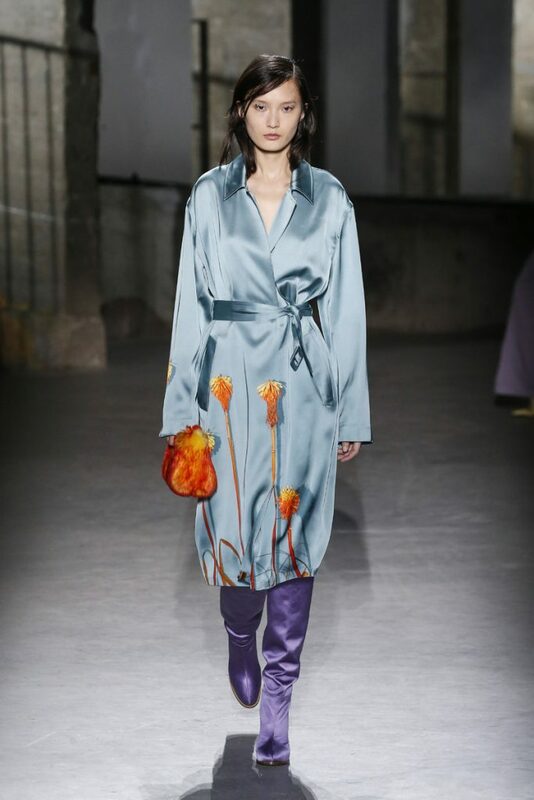 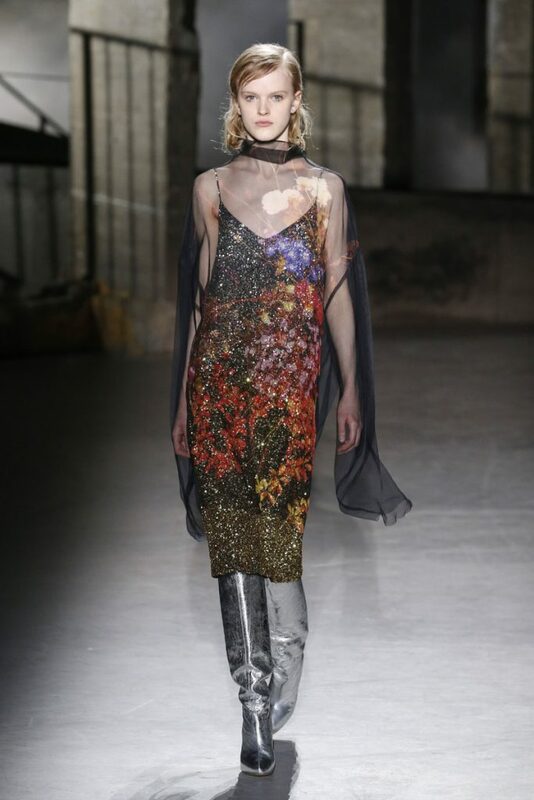 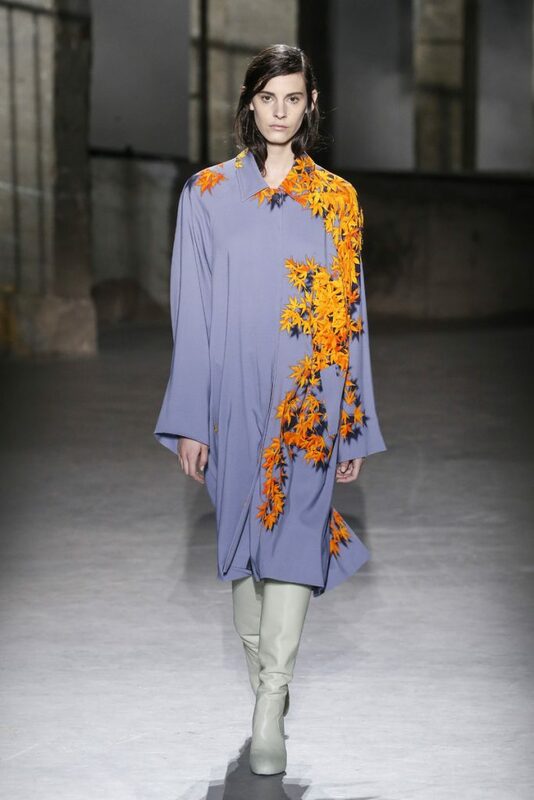 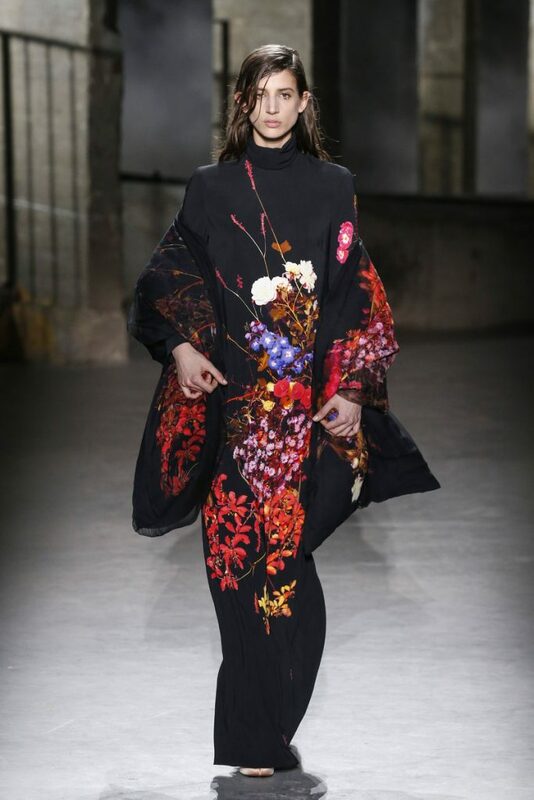 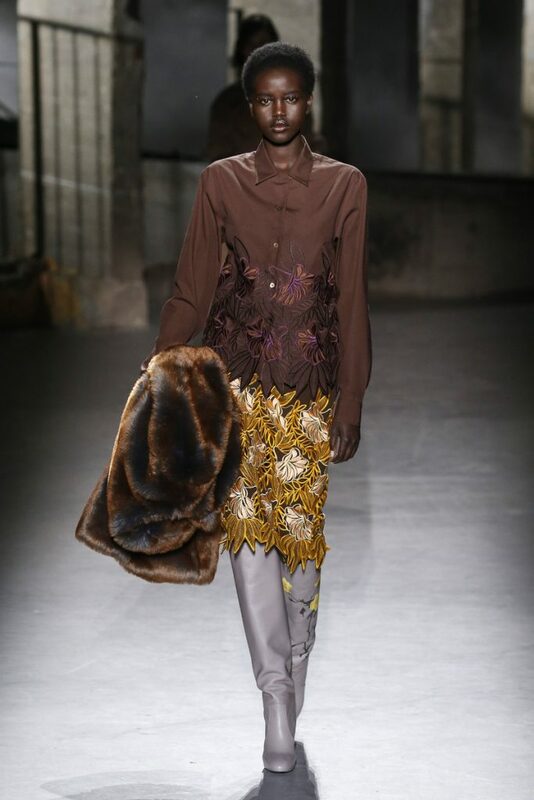 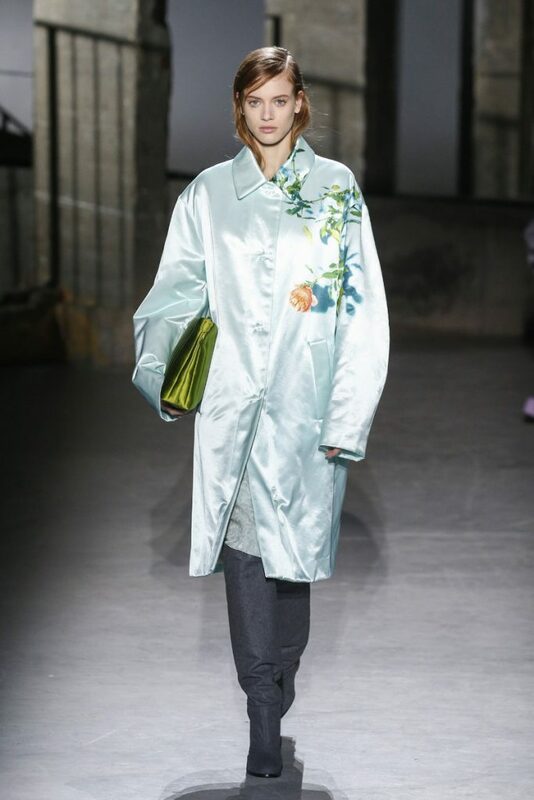 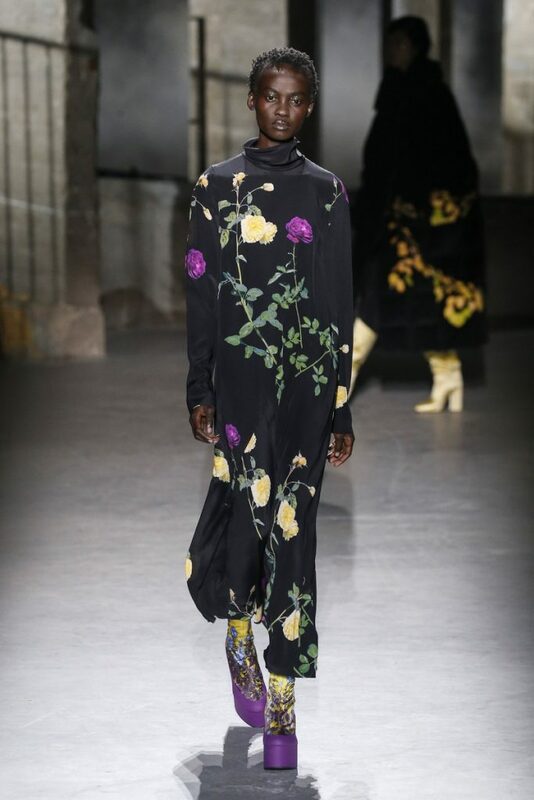 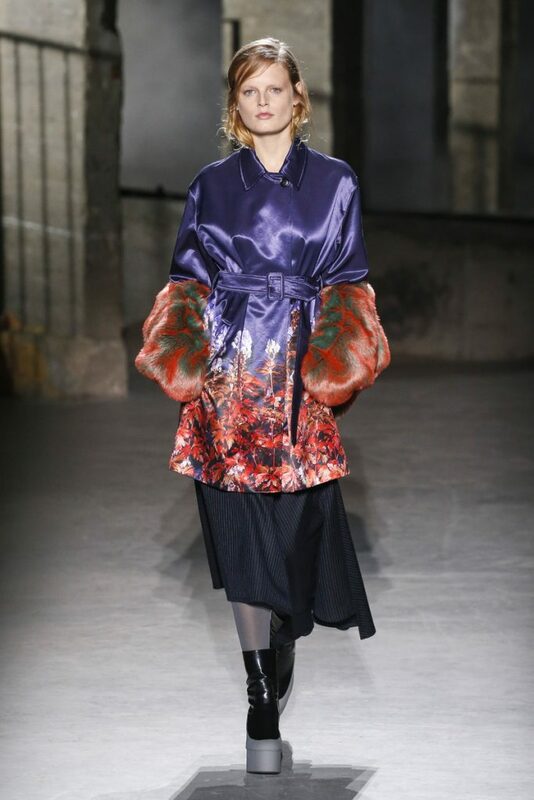 Those flowers, as it turned out, were inspired by flowers growing in Dries van Noten’s own actual garden. 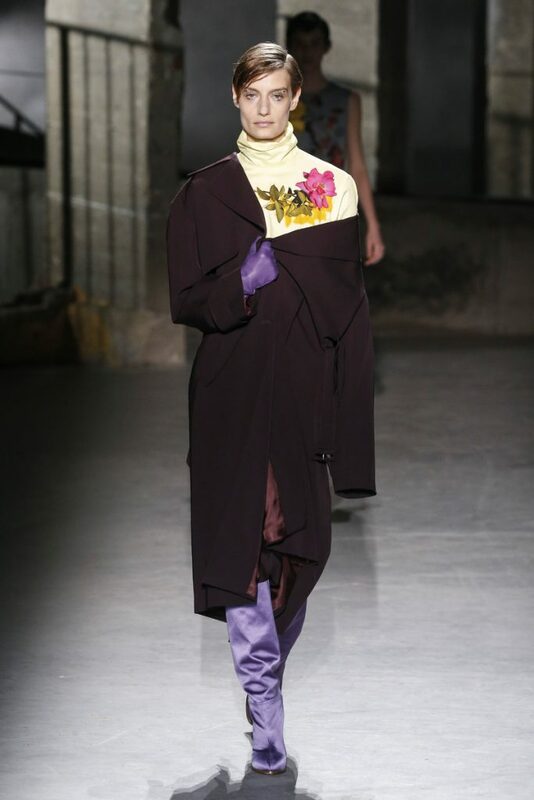 He and his team had been doing some gardening as a video at the end of the show showed us. 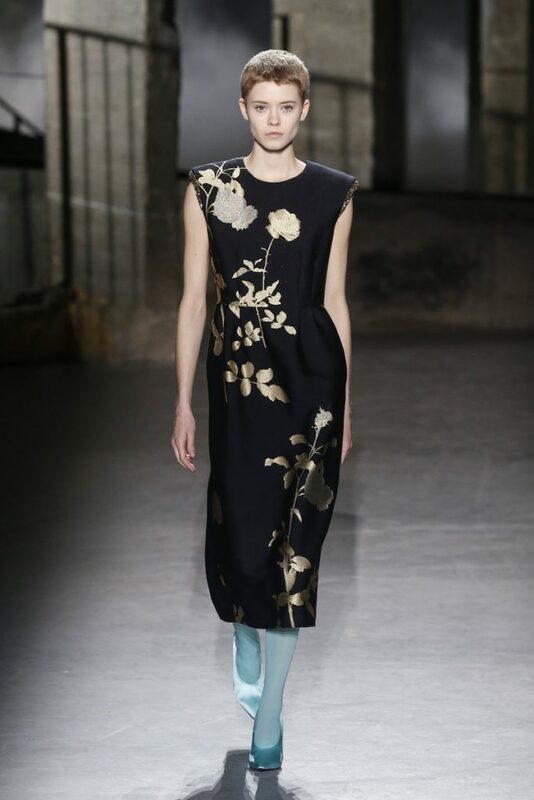 And so those flowers weren’t picture perfect but had imperfections too. 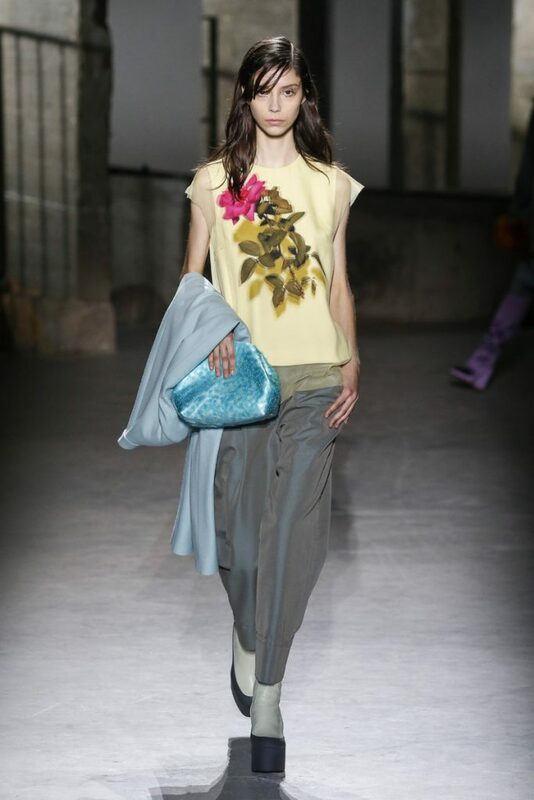 From lilac we slowly moved on to other pastel shades, like ice blue, mint green, powdery pink and light yellow. 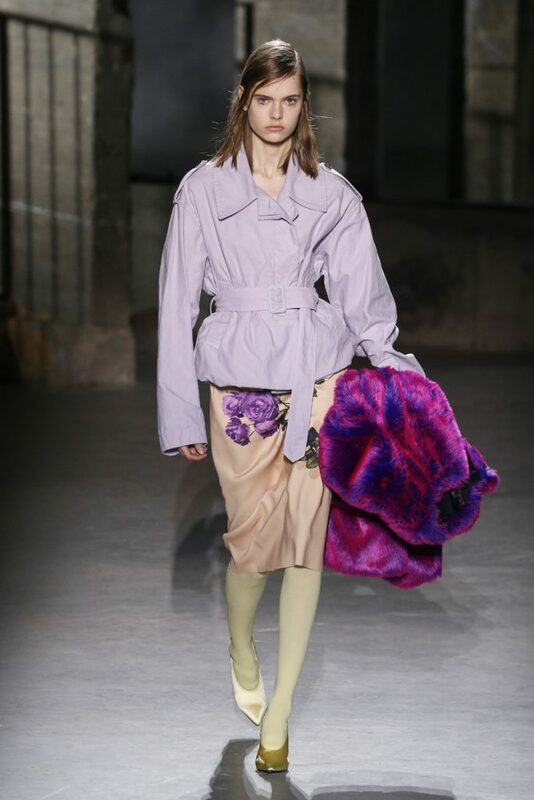 Shades that worked beautifully (Dries is a master in creating the most gorgeous palettes) with the much more vibrant orange and purple. 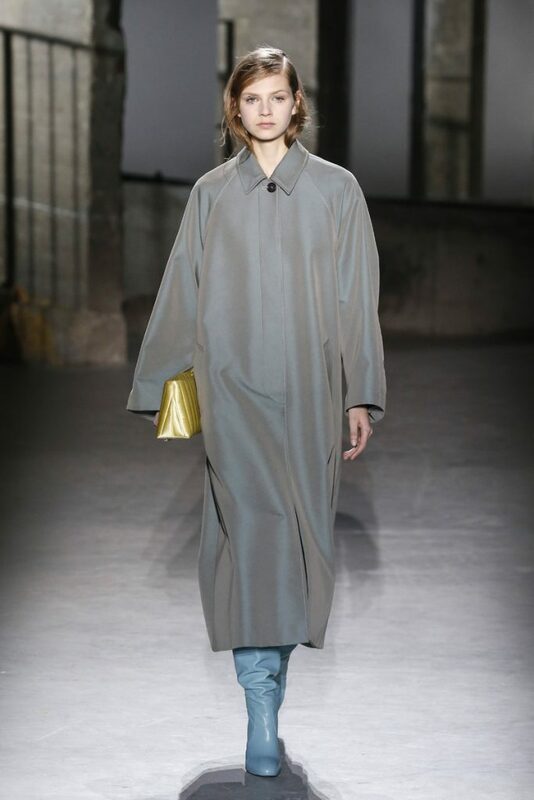 When mustard and brown shades were introduced all looks had a strong fall sense about them. 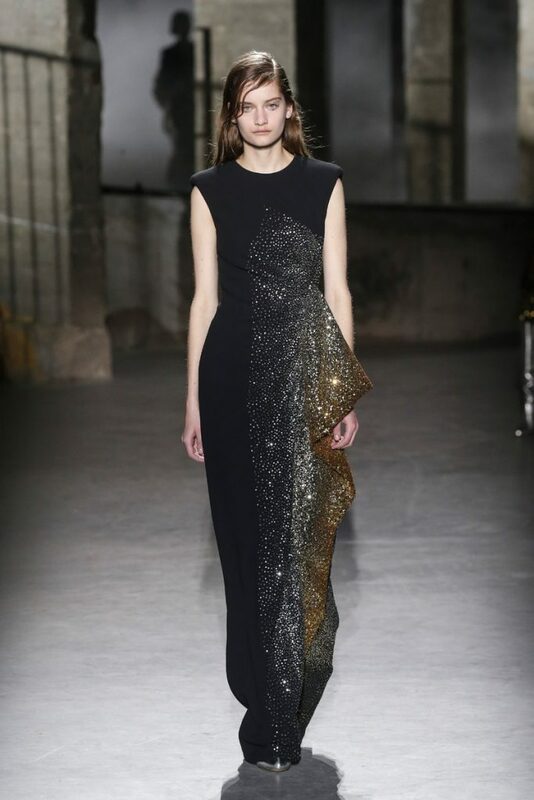 Dresses were extremely loose fitting and had high necks. 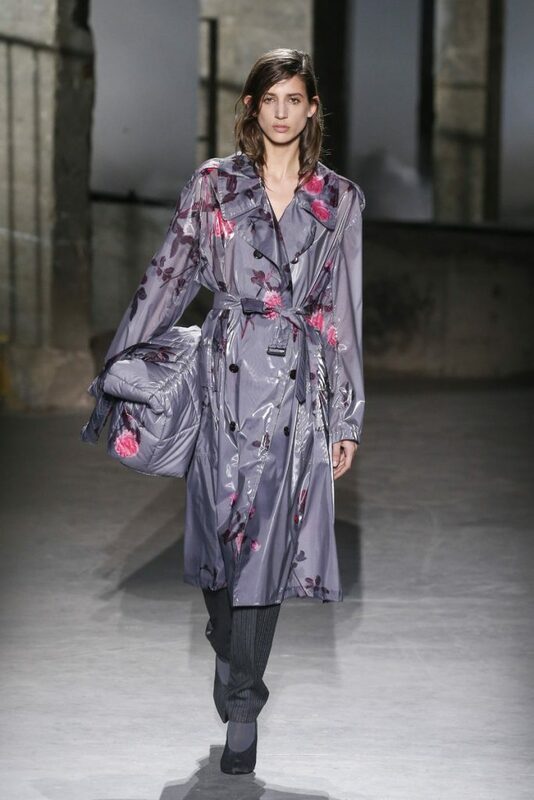 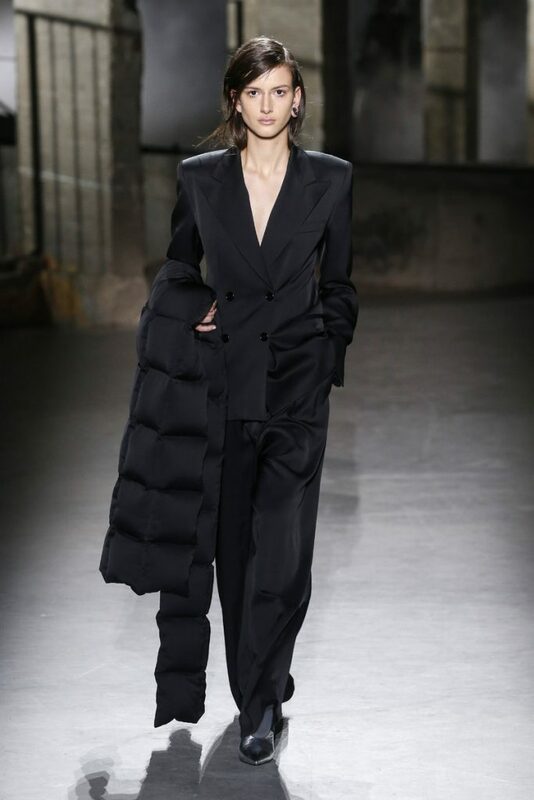 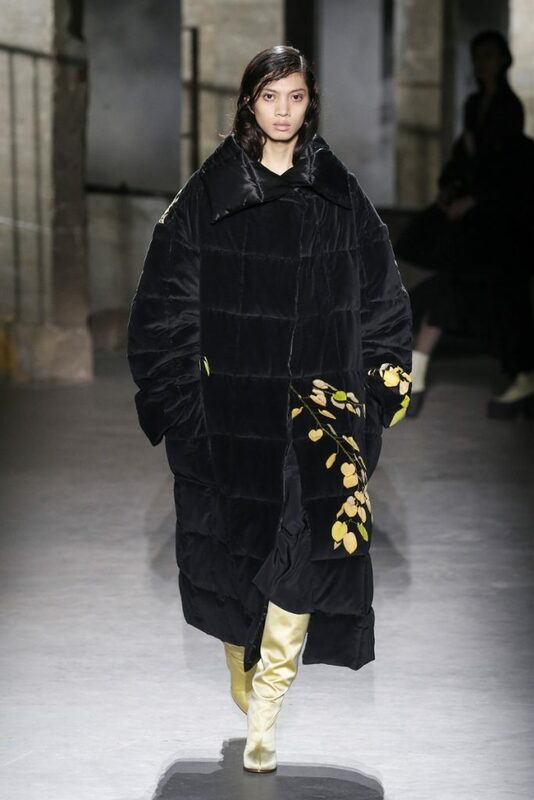 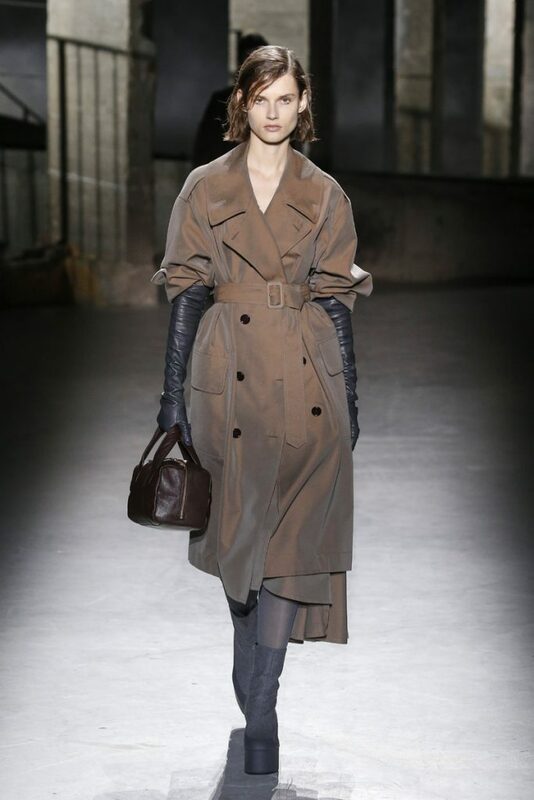 A trench and some satin robe inspired coats were cinched at the waist but other than that the silhouette for fw2019 was loose, fluid and roomy. 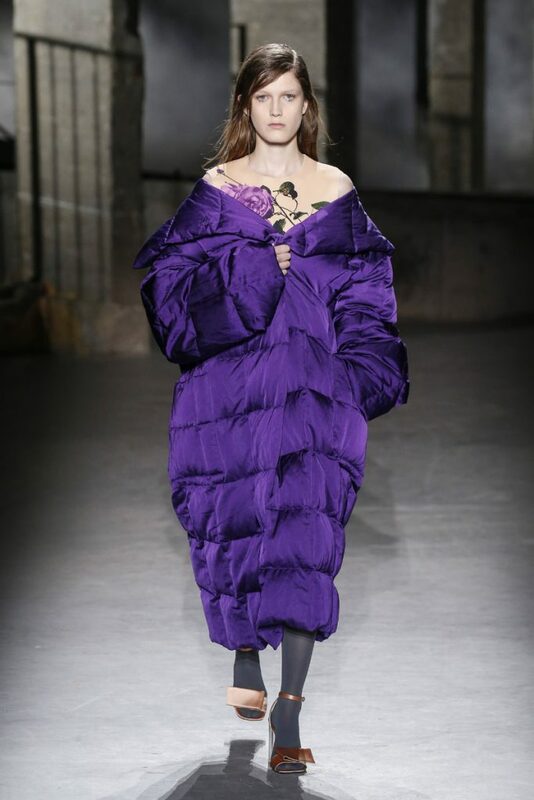 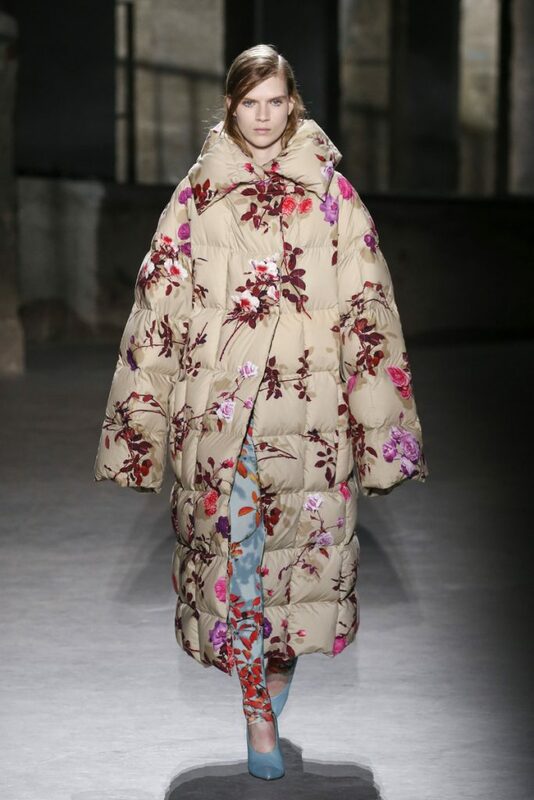 There were enormous floral printed puffers to survive the strongest of winters. 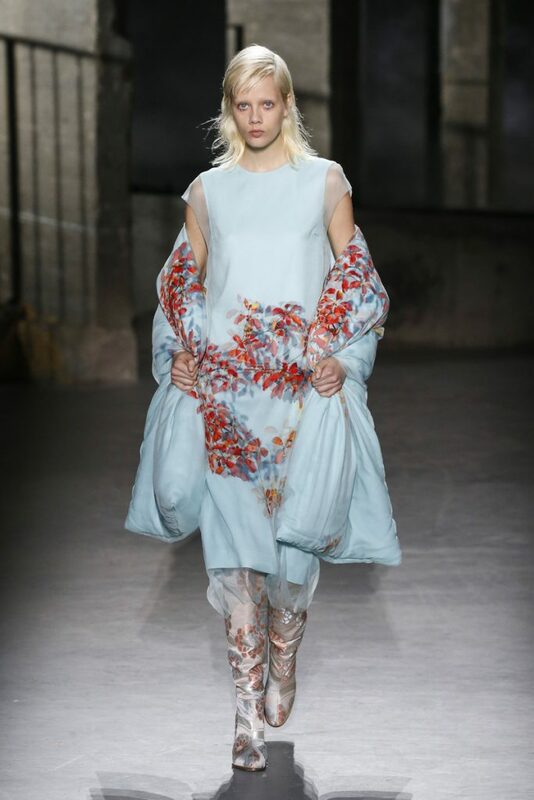 As some sheer looks, like an icy blue number with red leave embroidered added to the festive and elegant part of the collection. 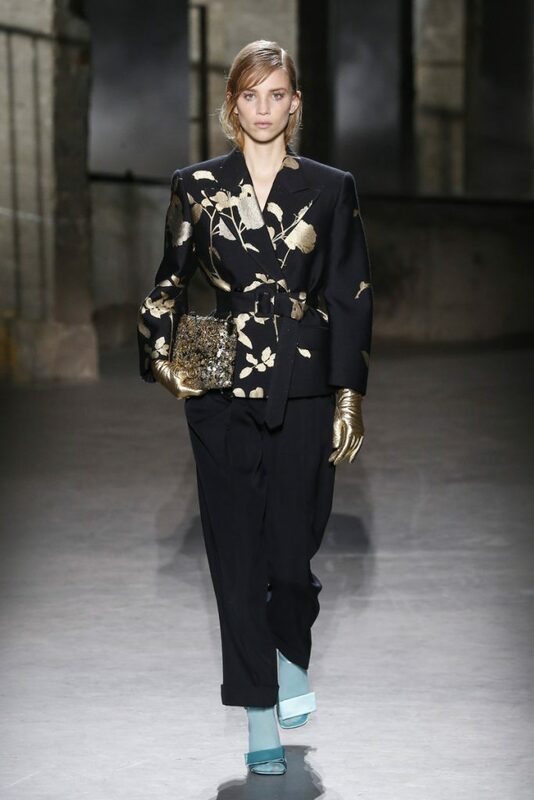 A finale of partly sparkling dresses (worn with golden gloves and silver boots) and a few tuxedo suits completed the fw picture. 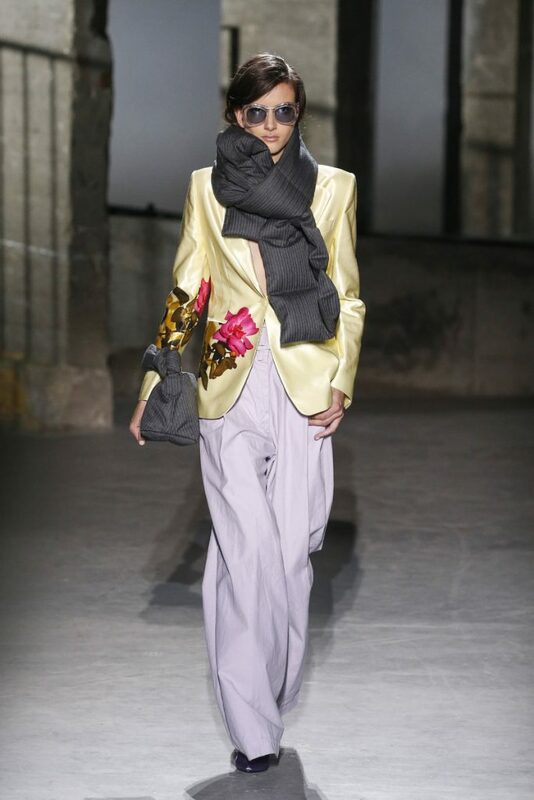 Puffer scarf under your right arm and your good to go.